The Florida Marlins may be a new franchise, but they already have a wild and wickedly successful postseason history that would make more established teams envious. The Marlins have been to the playoffs twice, both times as a wild card. They are a perfect 6-0 in postseason series and have been involved in three of the most exciting and extraordinary plays in baseball postseason history. There was little hint of the Marlins flair for postseason dramatics when they began play in 1993. The National League awarded the Florida franchise in 1991 to Wayne Huizenga, CEO of the movie rental giant Blockbuster. Huizenga already owned both the Miami Dolphins of the NFL and Florida Panthers of the NHL. The Marlins opened play in 1993 with a 6-3 win against the Dodgers. The rest of the season was a good news/bad news scenario. The bad news was the team finished 64-98. The good news is they avoided the National League East cellar, finishing five games ahead of the Mets. The next few years did not go much better. But by the time Jim Leyland became manager in 1997, Huizenga's free agent money had added Bobby Bonilla (.297, 17 HR, 96 RBI), Gary Sheffield (.250, 21 HR 71 RBI), and Moises Alou (.292, 23 HR 115 RBI) to the offense and Kevin Brown (16-8), Livan Hernandez (9-3), Alex Fernandez (17-12) and Rob Nenn (35 saves) to the pitching staff, all of them handled by the league's best defensive catcher in Charles Johnson. The Marlins won the wild card with a 92-70 record and then took out the Giants and the Braves in the National League playoffs. They defeated the Cleveland Indians in the World Series, winning on the first of their extraordinary postseason plays. The seventh and deciding game went to an 11th inning when Marlin shortstop Edgar Renteria whacked an RBI single just past the glove of Indian pitcher Charles Nagy to score Craig Counsell with the series-winning run. Florida became the youngest franchise to win a world championship (fifth season). They were also the first wild card team in major league history to win it all. Huizenga began dismantling his championship team almost as soon as Bud Selig handed him the World Series trophy. Claiming expenses were too high, Huizenga held a fire sale during the next year, selling most of his star players and leaving a devastated shell of a team that plummeted to a 54-108 season. The Marlins became the first team to lose 100 games the season after winning the World Series. Leyland resigned after the 1998 debacle, and Huizenga sold the team to businessman John Henry shortly thereafter. But the damage was done. The Florida fans felt betrayed by Huizenga's fire sale and they showed their anger by staying away from Marlins' games in droves. By 2002, the Marlins only averaged about 10,000 fans per game. To their credit, the Marlins continued to cultivate or trade for young talent, such as Luis Castillo, Mike Lowell and Juan Pierre, plus pitchers Brad Penny and Josh Beckett. Adding free agent catcher Ivan Rodriguez was the final piece of the puzzle for the 2003 season. Demonstrating they had not lost their postseason magic, the Marlins defeated the Giants 3-1 in the best-of-five first round, ending the series with another of their signature extraordinary plays. The Marlins had a two-run lead entering the ninth inning of the fourth game. The Giants got one run back and were bidding to tie the game when Marlin outfielder Jeff Conine threw out J.T. Snow at the plate. It was the first time in baseball history a postseason series ended with a game-tying run being thrown out at the plate. That play was only a sample of what was to come in the next series. Trailing the Cubs three games to two, and trailing 3-0 in Game Six, the Marlins became beneficiaries of the infamous (at least in Chicago) Bartman incident. A lifelong Cub fan, Steve Bartman prevented Cubs outfielder Moises Alou from catching a foul ball near the left-field stands that would have been the second out of the eighth inning. Inexplicably, the play changed the karma of the game and the Marlins rallied to score eight times before the Cubs got the third out. The Marlins won 8-3 and Game Seven the next night. They didnt make the playoffs again the rest of the decade. However, they continued to be competitive by developing strong prospects such as shortstop Hanley Ramirez, left-fielder Chris Coghlan and pitcher Josh Johnson. They also will finally move into a true baseball venue when they leave Sun Life Stadium (formerly Joe Robbie Stadium) in 2012. The retractable roof feature should help attendance and limit the frequent rain delays and weather-related cancellations that became common at Marlins games. Through it all, one thing has been consistent about the Marlins during their brief history: They may have had up and down seasons, but when they make the postseason, they have been flawless and they have been extraordinary. For the first 19 years of its existence, the team played its home games at Sun Life Stadium in Miami Gardens. In 2012, they will move into newly constructed Marlins Ballpark in Little Havana, Miami, Florida. On September 28, 2011, the Marlins introduced Ozzie Guillén as their new manager. On the same day, the Marlins played their last game at Sun Life Stadium with Charlie Hough and Benito Santiago being the first pitch battery, the same battery from the first Marlins game. The team also brought back former Marlins greats and released the All-Time Florida Marlins team and top 10 moments from the franchise's 19 year history. 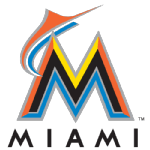 On November 11, 2011, the Marlins officially rebranded themselves the Miami Marlins with a new logo, uniform, and color scheme. The VIP event was held at the site of the new ballpark at night, featuring a private concert by Pitbull and a fashion show featuring the new uniforms worn by various Marlins players and coaches, including Guillen, Logan Morrison, Hanley Ramirez, and Josh Johnson. Miami Marlins Franchise Facts At-A-Glance on Baseball Almanac, Inc.
Marlins fans can relive the excitement of the 1997 World Series & 2003 World Series here at Baseball Almanac with composite batting averages, pitching statistics, line scores and box scores for every single game. The Florida Marlins played their first Major League game on April 5, 1993 . Their opponent was the Los Angeles Dodgers who they defeated 6-to-3 at Joe Robbie Stadium. Did you know that the 1997 Florida Marlins were the youngest expansion team in baseball history to win a World Championship?